On June 28, 2012, the U.S. Supreme Court ruled that the Patient Protection and Affordable Care Act (ACA) was constitutional. As the first anniversary of the Court’s decision approached, I took a step back from the rhetoric and controversy that continue to overshadow what this historic legislation means for my family and other families raising children and youth with special health care needs. 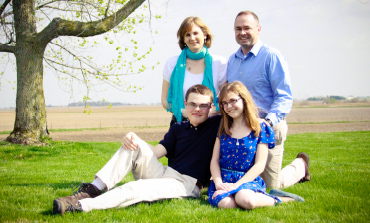 My two children — Matthew, 16, and Laura, 13 — have Mitochondrial Disorders, complex neuromuscular conditions. From birth, they have required extensive medical care. That care was costly, so costly that we quickly met the annual and lifetime caps imposed by our health insurance. Because of their medical conditions, Matthew and Laura joined the ranks of Americans whose pre-existing conditions made them uninsurable. My young family was locked into a world of limited choices. Fearing a gap in insurance coverage, we could not change jobs. We experienced financial hardship because once the annual and lifetime health insurance caps were met, we paid the tremendous cost of their medical services out of pocket. Luxuries like dinner out or cable television were unthinkable as bills for necessities — including our own medical bills — sometimes went unpaid. We survived, just barely, by making painful choices about treatment priorities. We lived under the shadow of deep concern for the future. How would our children successfully transition to adult life when life-saving treatment was outside of our reach? Because of their medical conditions, Matthew and Laura joined the ranks of Americans whose pre-existing conditions made them uninsurable. My young family was locked into a world of limited choices. During the Presidential campaign of 2008, it seemed possible that policymakers might be ready to tackle the brokenness of a health care system that painfully threatened so many Americans, including my family. The candidates spoke about the issues I was living with; we were part of the national conversation. I was thrilled that then-Senator Obama’s presidential campaign was the first to have a Disability Policy Committee. As Election Day neared, I was asked to speak on behalf of the campaign at the headquarters of Eli Lilly & Co., a major pharmaceutical company headquartered in Indianapolis. The audience was conservative, but they were listening thoughtfully and receptively to why health care and disability rights issues mattered to families in Indiana. It was then that I knew that America was ready for healthcare reform. Could anyone have predicted that passage of the ACA would come in the midst of a complex fiscal crisis, following the loss of its strongest supporter in the Senate with the death of Senator Edward Kennedy? At the time, it felt like anything that could go wrong would go wrong, a familiar feeling for parents of children with special health care needs. When the final floor debates and votes were happening in March of 2010, I found myself yelling at the TV, not for the NCAA March Madness, but for the madness on C-SPAN. It felt so personal. When the final bill was passed, I read every word. I am aware that knowledge is power and that knowing exactly what the ACA held would allow me to support my family and others in accessing its protections. My family celebrated September 23, 2010, the day upon which my children would be permanently insurable throughout their lives despite their pre-existing conditions. I took a full-time position and enrolled my children in coverage, something that would have been impossible just a few months earlier. With the successive increases in annual caps, mandated by the ACA, which my children (finally) did not exceed, our new insurance covered their medical services. The reality of the ACA changed the reality of my family’s life. Economic stability was within our reach. Our children could choose careers based on their aptitude and interests, and not by coverage options or by being forced poor in order to stay eligible for Medicaid as adults with disabilities. Unfortunately, the passage of the ACA did not entirely alleviate our anxiety about the future. We held our breath right up to the moment of the Supreme Court decision. That morning, I was in a doctor’s waiting room with my son, the same boy whose birth fifteen years earlier had made healthcare reform so important for me. We sat together reading the SCOTUS (Supreme Court of the United States) blog , knowing the decision was so much bigger than us, but at the same time oh so personal. As the “upheld” tweet came, I turned to him and said, “You have a future.” He smiled and said, “Yes. I’m going to be a dairy farmer.” I cried with relief for my own family and for the generations of children with special health care needs who would grow up in the new health care reality – what a different world it would be for them. The ACA is not perfect — I have yet to find any law that is — but it is a life-changing, life-saving step forward for our country. It’s been a wild ride, and it’s not over yet. The ACA is not perfect — I have yet to find any law that is — but it is a life-changing, life-saving step forward for our country. I am privileged to have felt its personal impacts and to have stood with so many others for whom this is far bigger than sound bites, rhetoric, and politics. Rylin Rodgers lives in Indiana. She currently serves as the Training Director and Family Leadership Coordinator for the Riley Child Development Center and is a Founding Director of Family Voices Indiana.